A major international exhibition opening Sunday at the Museum of Contemporary Art San Diego explores the often revolutionary avant-garde Latin American art from the 1960s to 1980s. “Memories of Underdevelopment” encompasses more than 400 objects by some 50 artists from eight countries in the museum’s downtown location in the Santa Fe Depot. It opens on Sunday, Sept. 17, with free admission that day provided by the Bank of America. The exhibit traces the Latin American experience with a “failed modernity,” from the massive, U.S.-inspired projects of the 1960s to the rediscovery of the region’s indigenous approach to societal development in the 1980s. “This exhibit goes back to when underdevelopment really became an issue,” said Julieta Gonzales, of the Museo Jumex in Mexico City, one of three international curators of the exhibit. 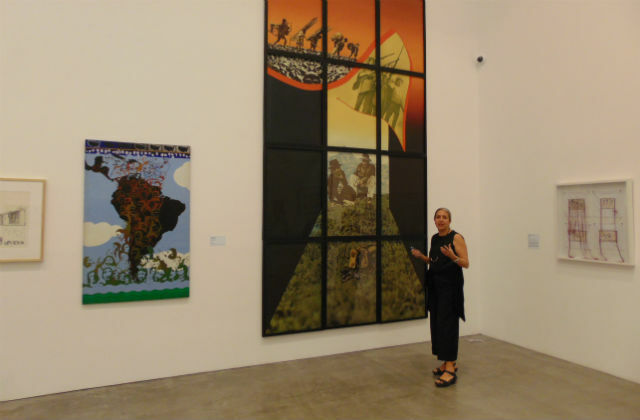 She said the artwork illuminates the contradictions arising from colonialism, underdevelopment and dependency, which combined to produce a pronounced dissonance in the period’s art. Works range from photos and graphics to posters, paintings, sculpture, videos and numerous multimedia objects. In one exhibit, a live anaconda — a reference to the U.S.-owned Anaconda Copper mine — lives atop a map of Chile. A photo from Mexico city shows Aztec ruins, a Spanish colonial church and grim high-rise housing. Finches in an open cage soil a religious print by Dutch artist Hieronymus Bosch. A model of an exhausted silver mine is dark and forbidding. Traditional Brazilian musicians burst out of modernist cubes. The show runs through Jan. 21, after which it will travel to Mexico City and then Lima. It is a joint effort with Museo Jumex and Museo de Arte de Lima under the Getty Foundation’s Pacific Time Standard project.